No, don't worry...the color green will not be splashed on every wall. 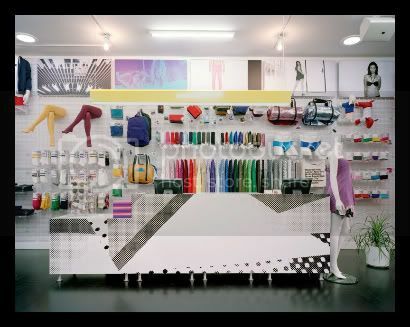 You will still be able to find American Apparel's signature white walls with white gridwall systems and huge over-sexed graphics in the newest Manhattan store. 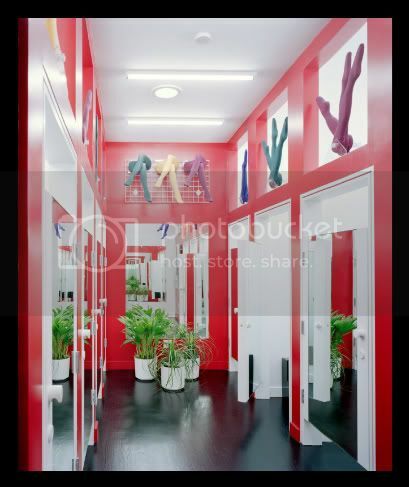 But, what makes this store different is that it is the first American Apparel to be designed with sustainability as a focus. 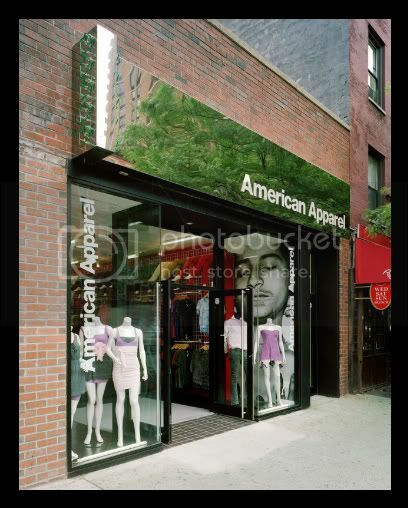 Really though, it took American Apparel THIS LONG to actually take the plunge and build an eco-friendly store? They are one of the few companies that really prides itself on sweatshop-free manufacturing, all American made products, and support of immigration rights. They even offer organic t-shirts, tanks, and underwear. With all of the "good" they are doing, it was only before so long that they adopted this into the design of their retail spaces. Goal: To "go eco-friendly without screaming green"
wow. that's awesome. I mean, I guess I am surprised that they didn't do it sooner too. great layout and use of color. we are sooooooo going to see more and more companies big and small "getting it" and becoming more responsible with their materials and waste. great post! Ooo wonderful! I do love AA, but it seems they've become THE hipster store in London, they doubled their profits this year despite the recession! Is it wrong that I'm 32 and love AA? I may be a bit old for holographic spandex, but their tees are kind of great. I love their aesthetic; glad to see it follows through to the stores. Maegan - #1, I just realized that you are the second Maegan I know who spells their name that way! #2, I'm thinking it must have been in the works for a while because that just blows my mind that it didn't happen sooner. Avant Garde - Thanks for your sweet comment! Aww!! Dapper Kid - Definitely a hipster store here too, but I can't help but love them, especially for their basics.